Exclusive is the liberty that each one allows himself. Our experience permits us to satisfy all your wishes. 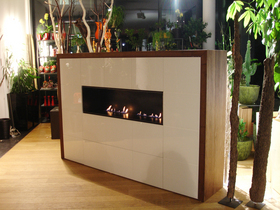 Here, we have a fireplace inserted in a furniture, in order to beautify the design of the room. 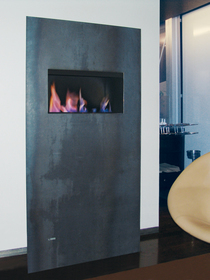 Our fireplaces can be integrated everywhere, in walls as well as in furniture. Thanks to our special insulation the surrounding keeps cold because the warmth stays only in the fireplace. A beautiful burning fire in a fireplace without chimney gives a pleasant atmosphere. The guests enjoy the environment. 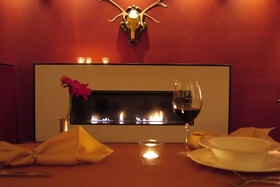 The inserted fireplace without chimney for evacuation improves the look of the restaurant. The magic of the flames accompanies the guest during his stay. 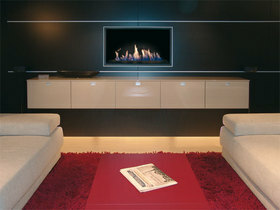 In this case, we manufactured a fireplace in steel, with a special insulation and movable cupboard doors. to be integrated in a specially constructed piece of furniture. 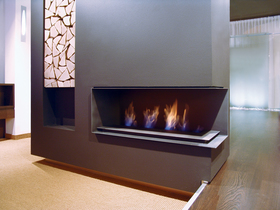 We have solution for all wishes if you want to have an open fireplace in a room without chimney. You have only to inform us about the exact measures and we will make you an offer. The mf-stoves allow to have a real fire at eye level. We have different solutions to enjoy the magic of the fire. The logs with their incandescent appearance increase the ornamental look and the wellness of the warmth of moving fire stoves. Our concept and design represents clear and simple lines. Hot-pressed original structured steel gives a special look to the stove. The stove “light-view” (the bright spot for a pleasant atmosphere) has been specially realized for an insider establishment at Innsbruck, Tirol (Rathausgalerie Café Restaurant Lichtblick). Pure design with a lot of individual possibilities. 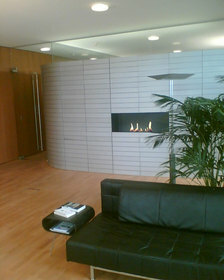 The installation of the stove “screen” against the wall is possible with a special constructed firebox. The stove can also be delivered to be installed in the room as “tunnel tool”, with a double sided firebox. Inspire yourself with our creation and imagine with us a new concept of your home atmosphere. See the new dimension of fire without chimney for the evacuation of smoke. 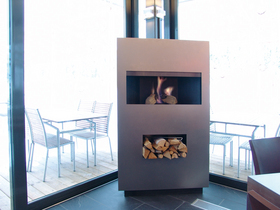 The stove « beach perl » has been specially realized for an insider establishment (Strandperle in Seefeld Tirol). Clear and perfect quality of surface underlines the sensuality of the stove. The customer requested a fire which could be seen from each part of the establishment. We realized his wish and constructed “beach perl”, which is now the pearl of this place. Our absolutely realistic wood decor, with carbonisation effect, together with our fire gives the natural shine of a fireplace fuelled with real wood-logs. It is a great pleasure to observe the flames.